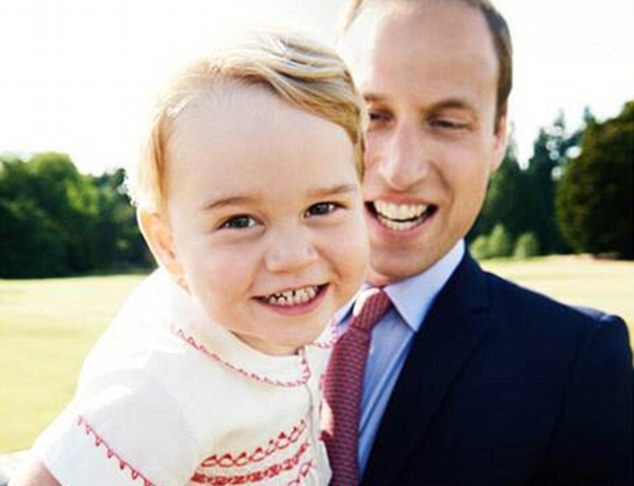 Grinning cheekily in his father’s arms, Prince George can’t resist monkeying around in this previously unseen photograph issued to mark his second birthday. The picture was taken by celebrated fashion photographer Mario Testino at his little sister Princess Charlotte’s christening earlier this month. The snap shows doting father Prince William and his son in the gardens at Sandringham House, the Queen’s private residence in Norfolk. William, who recently described his lively son as a ‘little monkey’, looks on with pride as George, who is third in line to the throne and was born at the private Lindo Wing at St Mary’s Hospital on July 22 2013, gazes adorably into the camera. The little prince is wearing the £85 Rachel Riley shorts and blouse that his mother, Kate, had made especially for the occasion. The outfit, which sold out in many sizes within hours of George first appearing in it, was a replica on one worn by Prince William when he went to visit his younger brother, Prince Harry, after he was born.